The dust has begun to settle on the annual college football coaching carousel and — brace yourself for the shock — it’s been another banner winter for middle-aged white guys, who are a perfect 14-for-14 in filling available FBS openings. In order to help you distinguish one receding hairline from the next, we’ve put together this handy, highly scientific ranking of the new hires, from the most likely to succeed to the least. Remember: Success is defined differently at Nebraska than it is at, say, Tulsa, and all hires are graded according to that curve. Jim Harbaugh elevated Stanford from laughingstock to BCS winner in four years. Jim Harbaugh took a dormant 49ers franchise to three consecutive NFC Championship Games and a Super Bowl. Jim Harbaugh swam the length of Lake Erie in the dead of night with a briefcase full of vital documents tied to one leg and an Asian carp clamped to the other. Jim Harbaugh infiltrated the North Korean regime on a humanitarian mission. Jim Harbaugh escaped from Alcatraz. Jim Harbaugh is featured on bass in rare bootleg sessions with Frank Zappa, Warren Zevon, and Prince. Jim Harbaugh single-handedly opened, stocked, and staffed a sustainably sourced soup kitchen. Jim Harbaugh led a ragtag band of light Numidian cavalry across the Alps. Jim Harbaugh ghostwrote an entire season of Frasier (one of the good ones). Restoring Michigan to a status worthy of the winged helmet will be the easiest job Jim Harbaugh has ever had. Everything that could have gone wrong for SMU in 2014 did go wrong, pretty much right from the start. But if Chad Morris isn’t right for this job, it’s possible no one is. Like Baylor’s Art Briles, architect of one of the sport’s all-time overhauls just down I-35, Morris is already familiar to Texans as a longtime high school coach, having won state championships in 2008 and 2009;1 also like Briles, Morris was an early adopter of the up-tempo/no-huddle system that has subsequently overtaken the college ranks, and successfully adapted his system to the FBS level as Clemson’s offensive coordinator. Briles won four state championships in the 1990s at Texas’s Stephenville High, where Morris took over as head coach four years after Briles’s departure for the college ranks. 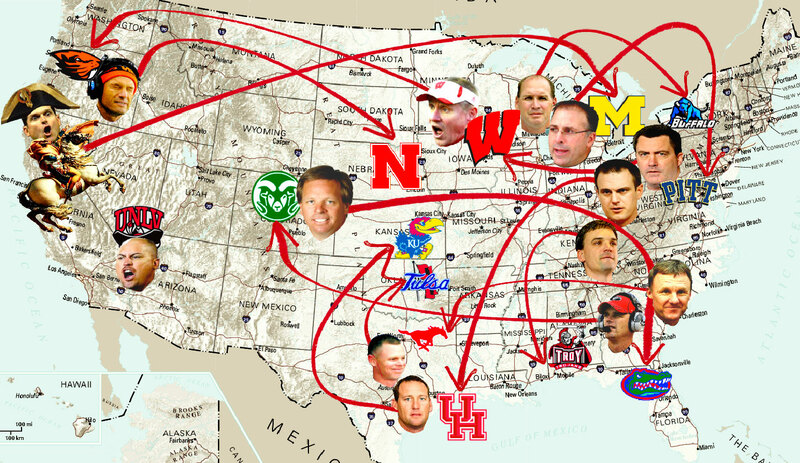 Track the firings, hirings, and general madness during college football’s silly season. The last coach to leave SMU with a winning record was Bobby Collins in the mid-’80s, on whose watch the program was temporarily nuked by the NCAA; since suffering the “Death Penalty,” the Mustangs have lost at least five games every year, giving them one of the worst winning percentages in the nation. But there’s more than enough talent in Texas to go around for a coach who knows the backroads, and the guy who changes SMU’s fortunes will climb to the next rung on the career ladder — possibly in Austin when the Longhorns run out of patience with Charlie Strong? — in short order. Regardless of the coach, Pitt is a perfect little marvel of mediocrity: Since 2010, the Panthers are 33-32 overall under three different full-time head coaches and just put the finishing touches on their fourth consecutive 6-6 regular season. In Pat Narduzzi, though, at least they have a fairly good idea what they’re getting. Narduzzi has spent the last 11 years as a defensive coordinator under scowly boss Mark Dantonio (first at Cincinnati, then at Michigan State), and he arrives with a clear mandate to remake the Panthers in the defensively driven image of MSU, a longstanding also-ran itself that has quietly won 11 games or more in four of the past five years on the strength of its defense. All those gritty, blue-collar, off-to-the-mills-in-our-hardhats groaners people love to trot out in reference to Pittsburgh? In the case of a Narduzzi defense, they might actually apply. The other coveted Big Ten assistant this winter was Ohio State offensive coordinator Tom Herman, whose offense lit up Narduzzi’s defense (among many others) this season and made Herman the winner of the Broyles Award as the nation’s top assistant coach, an honor that went to Narduzzi in 2013. At 39, Herman is joining a long list of Urban Meyer sidekicks who have graduated to head-coaching gigs of their own, a tree that includes Texas’s Charlie Strong, Mississippi State’s Dan Mullen, and Utah’s Kyle Whittingham, just to name the most prominent.2 Presumably, he also hopes to follow the trajectory of two recent Houston coaches, Briles and Texas A&M’s Kevin Sumlin, who lit up scoreboards with the Cougars and subsequently lit up their bank accounts in more high-profile posts nearby. See also: Boston College’s Steve Addazio, Marshall’s Doc Holliday, Illinois’s Tim Beckman, and the next entry on this list, Oregon State’s Gary Andersen. Although he’s an Ohio native, note that Herman spent the first decade of his career bouncing between multiple Texas schools, including a stint with the Longhorns as a graduate assistant under Mack Brown, and figures to be very much in the mix in Austin if/when the hourglass runs out on Strong. There’s still no obvious explanation for Gary Andersen’s decision to bail on Wisconsin after two perfectly respectable years there, and given the limited market for behind-the-scenes intrigue in Madison, there probably never will be. Just how badly does the situation have to curdle before a similar salary in Corvallis starts to look like a more attractive option? From Oregon State’s perspective, though, Andersen is an ideal catch: At 50, he’s a known quantity with a winning track record at both Wisconsin and (more impressively) Utah State, and he’s not necessarily looking to parlay a solid run at OSU into a better gig because, well, he just left a better gig. 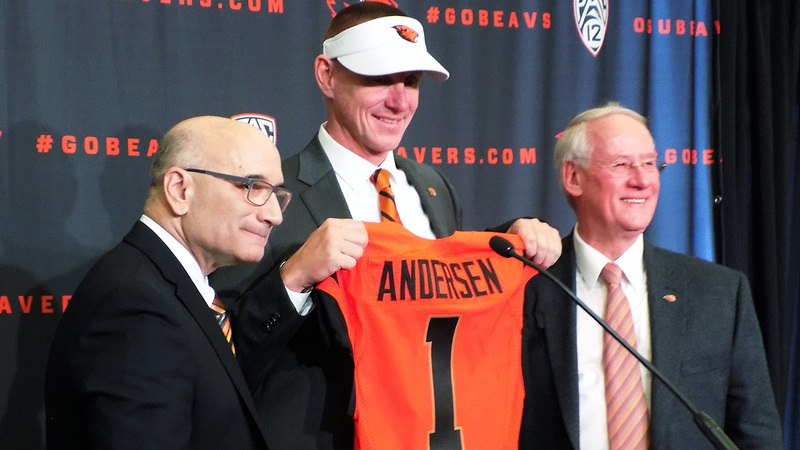 If the Pacific Northwest weather better suits his clothes — or the academic requirements better suit his recruits, or whatever it was that soured him on Wisconsin — Andersen could be around for the long haul. After watching Andersen and his predecessor, Bret Bielema, skip town for jobs that were lateral moves at best, the most ringing endorsement for Paul Chryst at Wisconsin is that he actually wants to be there. Chryst is a cheesehead to the bone: He was born in Madison, played quarterback at Wisconsin, and before taking over the top job at Pittsburgh spent seven years (2005-11) as the Badgers’ offensive coordinator, a span that included five top-20 finishes and back-to-back Rose Bowl bids in Chryst’s last two years. His head-coaching record at Pitt was somewhat less inspiring, as discussed above. At Wisconsin, though, he knows exactly what he’s walking into in terms of recruiting, assistant coaches’ salaries, and working under athletic director/head coach emeritus Barry Alvarez; if anything, Chryst’s Badgers should go right on Wisconsining as effectively as ever. If the school can’t make this marriage work, something is rotten. Had SMU not beaten them to the punch, the Golden Hurricane might have taken a swing at Morris, a prospect who initially entered the college ranks as a Tulsa assistant. Instead, Tulsa made an even more direct bid for “the next Art Briles” by hiring Baylor offensive coordinator Philip Montgomery, a longtime Briles acolyte from the high school ranks on up. Although the Bears’ offensive exuberance has always been attributed to Briles, Montgomery actually called the plays the past two years for the top scoring attack in the nation. At Tulsa, he’ll inherit an offense that ranked 103rd and 96th in scoring the past two years, and saw both the win-loss record and attendance dip accordingly. Most fan bases greet their new coach with a combination of enthusiasm and relief. Occasionally, there’s an element of surprise, and maybe a few notes of skepticism. 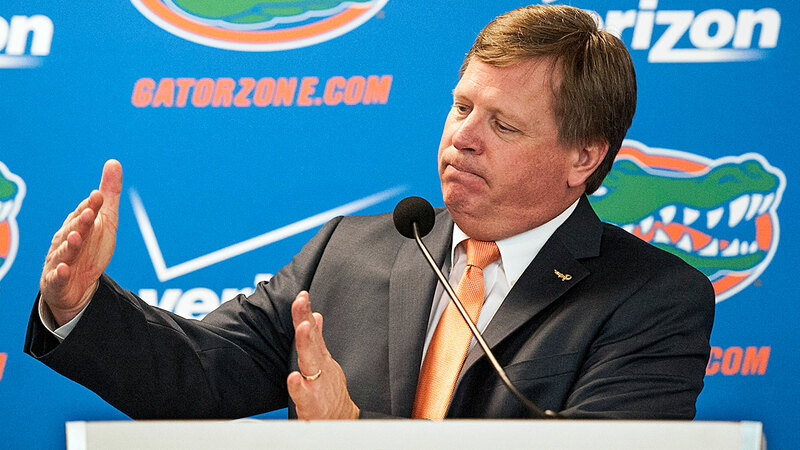 But rarely if ever can I recall anything like the collective shrug that accompanied the extended public courtship between Florida and Jim McElwain, who is qualified for the job in the same way that a new pair of pants are qualified to be a Christmas gift. They’re nice enough, they’re functional, and, if they fit, you can look forward to having them around for a long time with minimal maintenance. Like his doomed predecessor, Will Muschamp, McElwain is a product of the Nick Saban coaching tree, having overseen Alabama’s offense en route to national championships in 2009 and 2011. Unlike Muschamp, who had never been a head coach before landing in Gainesville, McElwain also padded his résumé with a three-year stint as the top dog at Colorado State, which produced a steady increase from four wins in 2012 to eight in 2013 to 10 last year. All that really says about his prospects at Florida is that the Gators didn’t hire a random person off the street. Beyond that, the next three to four years are anyone’s guess. The Rams’ last hire worked out so well that they decided to tap another SEC coordinator to be a first-time head coach. Georgia offensive coordinator Mike Bobo arrives from a long, underrated tenure at his alma mater with the same objective in Fort Collins that McElwain had: Deliver a winning record, get a handle on the big-picture CEO aspects of the job, and wait for a more high-profile gig to float gently into his lap a few years down the line. Until then, Bobo will have All-American wide receiver Rashard Higgins at his disposal for at least one year, further reducing the chances that he’ll ever heed Georgia fans’ demands to run the dang ball. Other than Harbaugh, Mike Riley is the most accomplished head coach on this list, having forged a perennial overachiever from a historical backwater in Oregon State. (Riley also has nine years under his belt as a head coach in the pro ranks, a stint notable mainly for two Grey Cup championships with the CFL’s Winnipeg Blue Bombers, in 1988 and 1990, and later for drafting LaDainian Tomlinson and Drew Brees in the 2001 draft as head coach of the Chargers.) At 61, he’s also a bizarre choice for Nebraska, a sleeping giant that grew increasingly impatient with diminishing returns under Bo Pelini. By all accounts, Riley is more approachable than his volatile, tantrum-prone predecessor, which ought to be worth a little goodwill in the honeymoon phase, at least. In 14 years in Corvallis, though, Riley’s teams never produced a conference championship, top-10 finish, major bowl bid, or any other result that might pass for success in Lincoln; nor is he regarded as an innovator or an especially energetic recruiter. Pelini failed on all of those counts, too, and was shown the door despite winning at least nine games in every year of his tenure. For a hometown underdog just looking to remain competitive, Riley was a solid long-term steward. For an established program looking to raise the bar, he may be the lowest-ceiling hire the Cornhuskers could have reasonably made. At 34, Neal Brown is young — the youngest new head coach hired in this cycle, in fact, and the second-youngest in the entire FBS — but in a sense the erstwhile Kentucky offensive coordinator marks a return to the good old days: Brown’s last stint at Troy, as a boy wonder assistant, coincided with four consecutive Sun Belt conference championships from 2006 to 2009. In the meantime, the Trojans’ descent to the bottom half of the SBC was enough to convince Brown’s old boss, 67-year-old Larry Blakeney, to hang it up after 24 years on the job. Brown may have only started shaving about halfway through that span, and he presumably has no intention of entrenching himself for any longer than it takes for a better opportunity to come knocking. But hey, in the short term at least he’s not Houston Nutt. 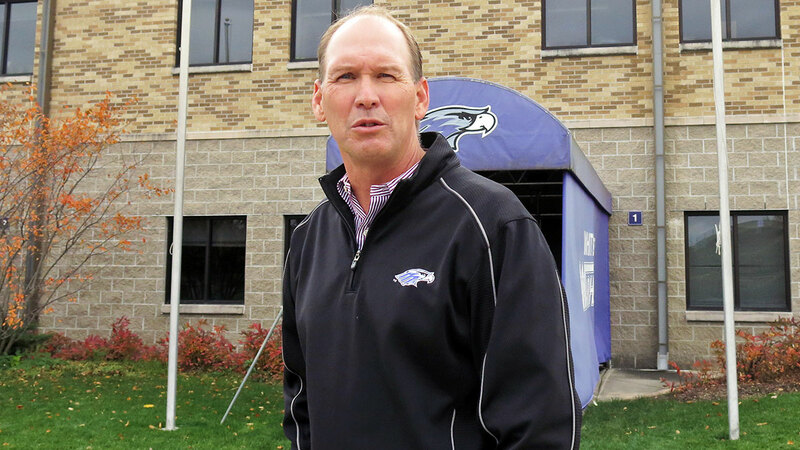 Here’s what you need to know about Lance Leipold: In eight years as head coach at the University of Wisconsin-Whitewater, his teams amassed a record of 106-6 (!) and captured six Division III national championships. In November, he became the fastest coach in NCAA history to reach 100 wins.3 Now Leipold is the head coach at Buffalo, which has recorded fewer than 100 wins in 25 years as a major program. Let it never be said that the man doesn’t appreciate a challenge. The previous record holder, Gil Dobie, needed 108 games to reach 100 wins … in 1921. At least former Texas A&M assistant David Beaty understands exactly what he’s getting himself into here: After separate, short-lived stints at Kansas under two different head coaches, Mark Mangino and Turner Gill, Beaty has seen up close just how dire the situation in Lawrence really is — the Jayhawks have a grand total of four conference wins since 2009 — and how it got that way in the first place. On his first day on the job, Beaty told reporters that one of his top priorities was to build “the most powerful walk-on program in the country,” a somewhat desperate idea cribbed directly from the enviable, ongoing success of Bill Snyder’s Island of Misfit Toys at Kansas State. But it is an idea, which is more than the Jayhawks can say for the previous administrations. At this point, pretty much any plan qualifies as a good one merely by being a plan. Simply tacking Tony Sanchez onto the bottom of this list as the least likely to succeed would be grossly unfair, for two reasons. One, UNLV is universally acknowledged (even by its own administration) as a black hole from which no coaching career escapes intact; no one has succeeded there in 30 years. And two, as a career high school coach with no significant college experience, Sanchez is such a wild card that he could just as well turn out to be the most inspired hire of the lot. While the Runnin’ Rebels have continued to languish in futility, Sanchez’s teams at nearby Bishop Gorman High have filled the gridiron void in the city by obliterating everyone in their path en route to six consecutive Nevada state championships.4 At the same time, Sanchez has earned a reputation for courting big donors like casino magnates Frank and Lorenzo Fertitta, who bankrolled a $10 million stadium that bears their name and a 41,000-square-foot athletic center for Gorman that easily surpasses the facilities at UNLV. The 2014 team ended its season in December as the no. 1 high school team in the nation according to MaxPreps and USA Today, having navigated an ambitious out-of-state schedule in September and subsequently outscored in-state opponents by nearly 500 points (543-54) over nine games. The track record of the few coaches who have made the leap directly from high school head coach to major college head coach with no intervening grace period as a college assistant is dismal. Still, given Sanchez’s profile in the city and UNLV’s miserable track record with traditional hires, it’s hard to imagine him doing any worse. After all, you can’t really call it a gamble if you have nothing to lose.